Why are some people so much better than others at talking their way into a job or out of trouble? What makes some advertising jingles cut through the clutter of our crowded memories? What's behind winning campaign slogans and career-ending political blunders? Why do some speeches resonate and endure while others are forgotten moments after they are given? The answers lie in the way words are used to influence and motivate, the way they connect thought and emotion. And no person knows more about the intersection of words and deeds than language architect and public-opinion guru Dr. Frank Luntz. 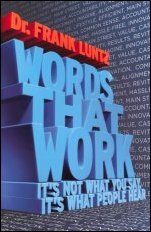 In Words That Work, Dr. Luntz not only raises the curtain on the craft of effective language, but also offers priceless insight on how to find and use the right words to get what you want out of life. Whether your goal is to boost company sales, win political office, inspire your employees, or get that raise you deserve, Dr. Luntz has something instructive to say about how language can help. Learn about the phenomenon of transforming mere words into an effective arsenal for the war of perception we all wage each and every day. Take it from the man who helped craft "The Contract with America," who turned the mild-mannered term "estate tax" into more politically charged "death tax," who reframed "drilling for oil" into "exploring for energy" -- words can and do mean the difference between success and failure. We all submit to the power of language, whether we know it or not. And the right words can give you the edge in any venture.